Snickerdoodle is a flopper. Anytime. Anyplace. Anywhere. I love seeing her tummy. Makes me wanna give her a tummy rub every time. Seriously… I want to one day meet your lovely rabbit. :) Maybe when I make it to California. How cute. 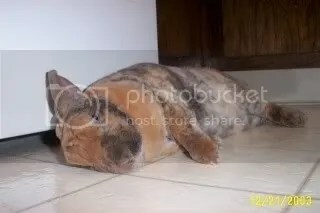 I wish I had a bunny! I just love Snickerdoodle! I am amazed at how puppy like he is…did you send him to bunny boot camp or are they just naturally awesome?